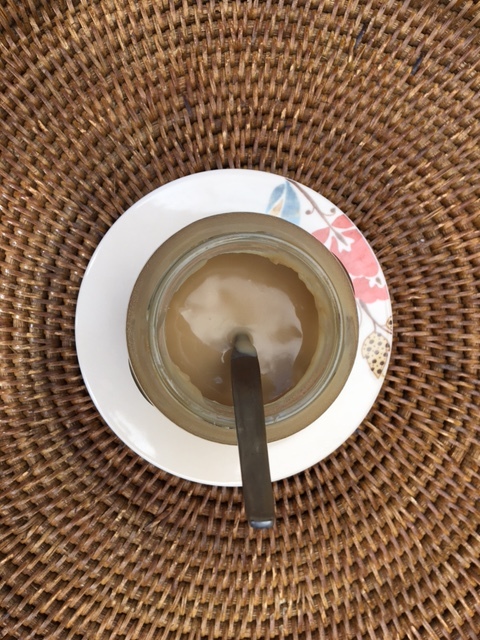 This is a very simple recipe for vegan dulce de leche. I love the coconut flavour here, it adds something to the classic recipe. It’s a treat that keeps well in the fridge and is really versatile. I hear that in Puerto Rico they make DDL with coconut milk, so this might even be a traditional-ish recipe. Who knew!? I think this is very coconuty, so I’ve swapped the name to reflect this. Up here in the North lands (UK) we need a touch of sweetness. The skies are dark grey and its one long drizzle-fest. Some call it summertime in these parts. Jane and I are creatures of the sunshine, it’s a bit of shock to the system really, but we know how it goes. Moving on from weather, how about something sticky, sweet and gorgeous. This recipe only has a few of ingredients and requires a long, slow simmer which transforms it into something incredible. I always associate Dulce de Leche with my travels in Central America many years ago, it was a regular source of sweetness and when things were limited menu wise, you always knew dessert was looking good! I remember going camping in the volcanoes of Guatemala (may sound a bit Joseph Conrad, but there are loads of people doing it). Our guides were lovely guys and we had an incredible time watching the sun rise over a strip of active volcanoes as they blew ash, boulders and toxic gas up into the ether. For dinner, we had beans. Then came dessert. I peered into the pan bubbling over the fire to see a tin being boiled. I was intrigued and a bit uninspired by its potential tastiness. Turns out it was Dulce de Leche. 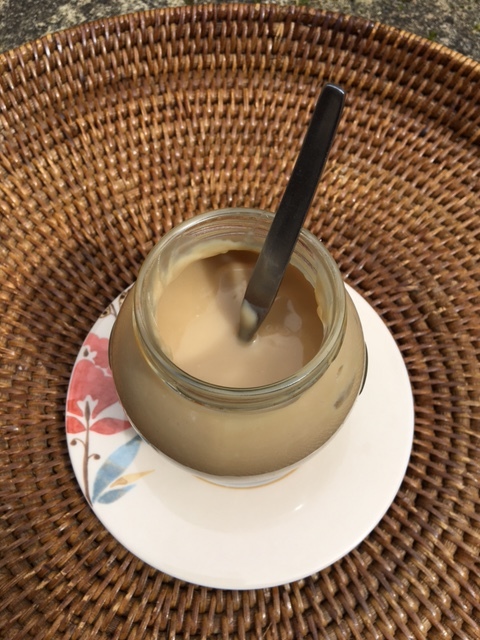 A tin of condensed milk boiled for a while produces old school Dulce de Leche. But this recipe is easily as rich and moreish. Like any much loved food, Dulce de Leche has quite a few variations and regional this and thats. In many parts of Latin America, its cooked right down, like a crumbly fudge. In Cuba they used curdled milk (which I’d like to veganize soon) and in Mexico they add vanilla to the mix. In Chile they make ‘manajar’ which has cannabis added, sure to liven up your morning toast. Variations are also traditionally made in France, Norway. Poland, Russia……it’s a worldwide craze! 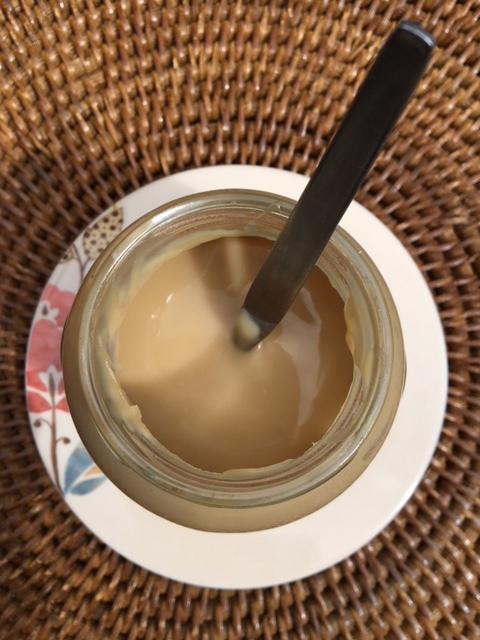 Dulce de Leche is just milk slowly cooked with lots of sugar, the longer you cook it the more it caramelizes and gets more funky and deep in colour, sticky and lovely. It can do anything; on toast, as a filling or topping for cakes, stirred into smoothies, porridge or rice pudding. Really though, I’m a purist, straight out of the jar, onto a spoon. 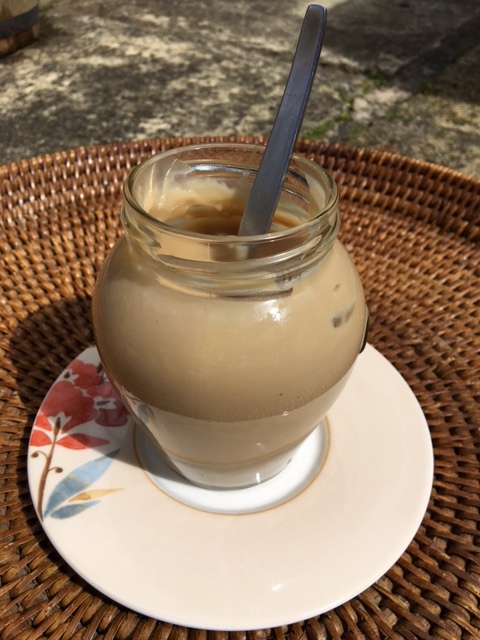 There are a raft of recipes on line for vegan dulce de leche, I like the idea of using dates cooked with the coconut milk, but the results were not anywhere near as good as this recipe. I’m going to keep looking into that one though. A thick bottomed sauce pan here is ideal. Otherwise, keep stirring and ensuring your bottom doesn’t burn. Remember, the longer you cook it. the deeper the colour. I like this lighter version, but cook it longer if you fancy something deep. dark and super rich. I add much less sugar than your average dulce de leche, I find it easily sweet enough to satisfy my sweet tooth. Add more if you fancy. If you feel like going a little Mexican, why not try adding 1/2 teas vanilla extract? Place the bits in heavy bottomed sauce pan, heat on medium and whisk until the sugar is dissolved. Allow the milk to boil and bubble gently until reduced to roughly 250ml stirring often and the colour has darken to a deeper brown. This takes around 40-50 minutes. Take this as far as you like. The longer you cook, the sweeter and thicker it will become. 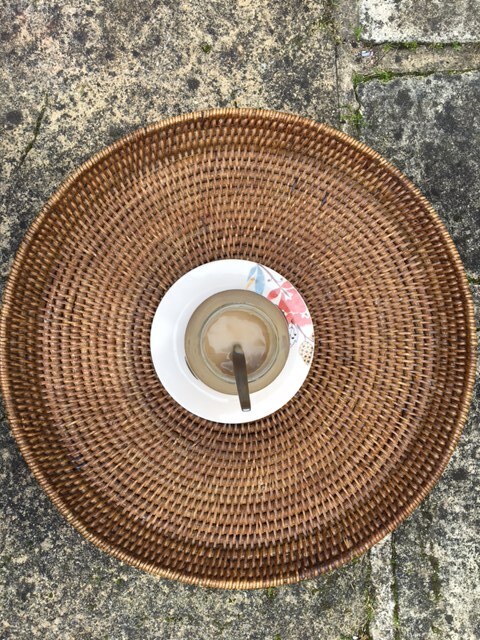 Pour into sterilised jars and leave to cool. Pop a lid on and keep in the fridge. Will keep for a month quite happily. If it separates, simply stir it. Hope to see you in North Wales soon! !